Samsung Galaxy S8+ Full Spec Sheet Leaked - Did it Impress You? 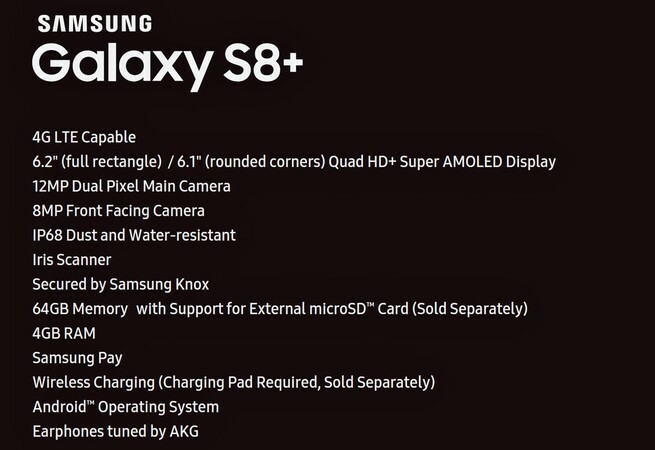 Samsung Galaxy S8+ Full Spec Sheet Leaked – Did it Impress You? Evan Blass is back today with yet another leak and this time; it is of the upcoming Samsung Galaxy S8+. We have heard a lot about the S8, but there was less information about the S8+. Today, a full spec sheet has been leaked that reveal almost every single feature of the phone. Keep in mind that we are 100% sure abut the authenticity of this leak as every information that we have got through Evan has turned out to be legit. One of the main things that are going to distinguish the S8+ from the S8 is surely the screen size, and except that, most of the specifications are going to remain the same. And yes, don’t forget the bigger battery because with a large screen, comes a big battery. Starting off with the screen, the Galaxy S8+ is going to have two different variants in term of the display. One variant has a 6.2-inch Full Rectangle screen whereas the other has a 6.1-inch screen with rounded corners like the G6. Not to forget that this is the Quad Hd+ Super AMOLED display so, we can assume that S8+ is going to have the best smartphone display we have ever seen. Evan Blass has confirmed that Snapdragon 835 will power the device along with the Adreno 540 GPU. This, along with 4GB of RAM is going to make the S8/S8+ the fastest smartphone we have ever seen. Talking about the camera, it seems the S8/S8+ will retain the camera from the S7 with a 12MP rear (dual pixel camera) and an 8MP front-facing camera. VOTE NOW: POLL: Do You Like Galaxy S8’s Fingerprint Scanner Placement? There could be different storage variants but the spec sheet that leaked today shows 64GB internal storage variant with external SD card support. Some other features include the IP68 Rating (Water and Dust Resistant), Iris Scanner, Wireless Charging, Samsung Pay and Samsung Knox. Well, as we mentioned in the beginning, the Galaxy S8+ is not different than the Galaxy S8 except the screen and battery size. Users who were expecting a 6GB S8+ will surely be disappointed today, but we all know how good is Samsung’s RAM optimization, especially for its flagships. So there should be no need to worry. What are your views? What should be the price of S8+? Do let us know via the comments section.